ADV Films(original licensor), FUNimation(new licensor) AIC/JVC/Victor Ent. The above info came from jdhc88dbzhhsband, and was edited by yours truly (contact me). The image came from The James Bond Online A2Z. 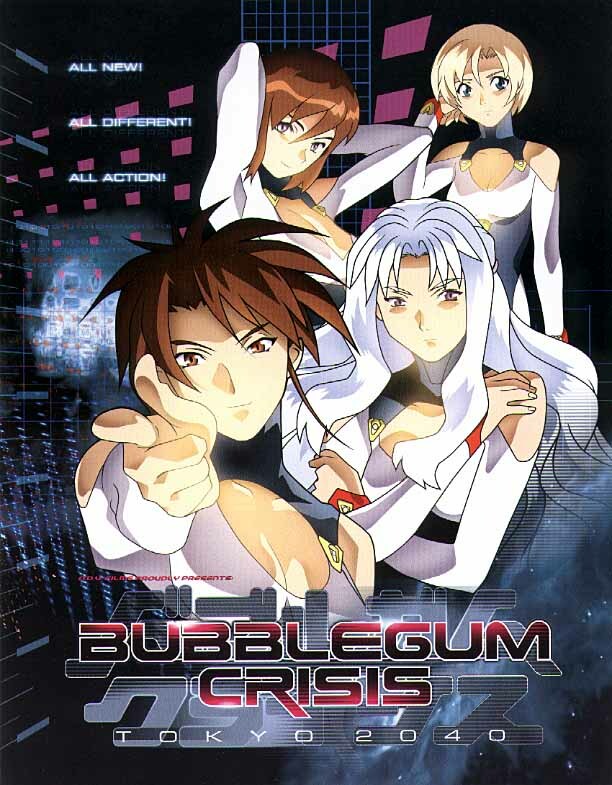 This anime is a remake of the original Bubblegum Crisis. And obviously, it takes place in the year 2040. It all starts when Linna Yamazaki moves to Tokyo, secretly planning to join the Knights. She is ran over by Priss Asagiri, and begins to follow her. Priss eventually leads her to Sylia Stingray's store. From here the story fans out encompassing everything. You soon learn that the Boomer Corporation is out to destroy the Knights. As the story continues, you begin to gain insight into Sylia's past and the origin of the Boomers. This is where Macky comes in. After a few more episodes all hell breaks loose as every Boomer in Japan goes on a crazed killing spree. The Knights are forced into an epic battle with the mother of all Boomers that takes place on a satellite in space. In the end, the Knights are triumphant and all the world is saved from the crazed Boomers. The above description came from jdhc88dbzhhsband, and was edited by yours truly (contact me).